Join the Mud Hens and Fifth Third Bank as we take a stand against cancer during Stand Up To Cancer Night at Fifth Third Field on Sunday, August 27. The event aims to raise awareness, as well as funds. for Stand Up To Cancer's accelerated cancer research programs, while shining a spotlight on those fighting the disease. "I Stand Up For" placards will be handed out before the game. Fans can personalize their placards as a way of supporting a family member or friend fighting cancer, honoring survivors, or remembering those they've lost. During a break in the game action, we'll share the placard messages on our giant video board. For each strikeout a Mud Hens pitcher registers during the game, Fifth Third will donate $5,300 to Stand Up To Cancer, an initiative dedicated to raising funds to accelerate the pace of research to get new therapies to patients quickly to save lives now. Fifth Third will also donate $1 per game attendee. Eight pediatric care patients from the Toledo Children's Hospital will be honorary Mud Hens for a day! As part of this experience, they will be announced as our honorary Starters of the Game and will get their own baseball card. During the game, fans will be able to visit the kids on the main concourse and get their cards signed by each of them! Fans are encouraged to take photos at the ballpark that night and post them to Twitter, Facebook and Instagram using the hashtag #howifight. 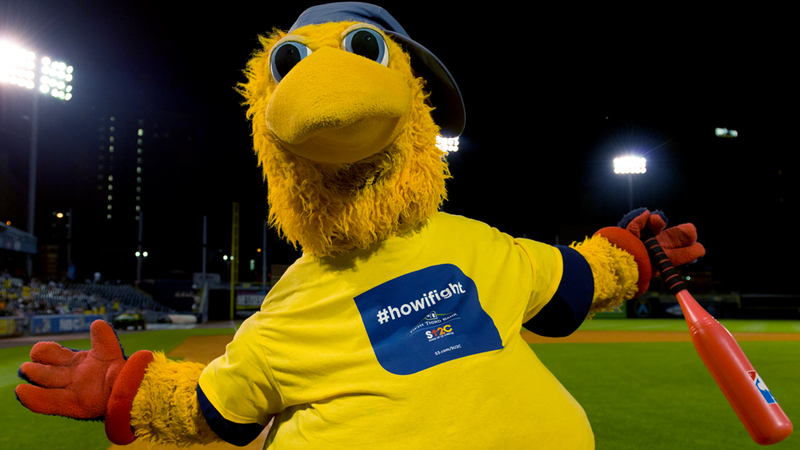 Fifth Third will donate $5.30 to Stand Up To Cancer for every eligible public use of the #howifight hashtag. NINE at Hensville: ninehensville.com | Chef Tony has put together a menu that he describes as "traditional Americana" where he uses local ingredients from area farms and producers to create made-from-scratch dishes with a modern taste and composition. NINE is housed in the former Folger Butcher Shop, a historic 1865 building. Exposed brick, reclaimed wood and handcrafted tables give NINE a casual vibe that fits a fun, downtown, neighborhood restaurant. Fleetwood's Tap Room: fleetwoodshensville.com | Have a drink at Hensville's new craft beer bar, located on the first floor of the Fleetwood Building across the street from Fifth Third Field. Fleetwood's Tap Room features 48 beers on draft, a wide selection of whiskeys, an eclectic menu, and an outstanding outdoor patio that overlooks Hensville Park. BirdCage Bar & Grill: birdcagebarandgrill.com | The BirdCage Bar and Grill is located on the Club Level at Fifth Third Field and provides incredible views of the on-field action! Your ticket to the Mud Hens game gives you entry to the BirdCage, where you and your guests will enjoy a great dining experience created by Chef Tony House, featuring a display of hand-carved meats, antipasti, classic salad, and seasonal entrees.